Zero-commission brokerage company Robinhood was recently in the news as its customer base surpassed that of more established competitor E-Trade. Robinhood now has 4 million accounts approved to trade, higher than the 3.9 million figure for E-Trade. At its most recent funding round, Robinhood was valued at $5.6 billion. However, there are questions around how much revenue the company is generating, and whether it will be able to grow its top line profitably enough to justify its high valuation. Data around Robinhood’s revenues is not available as it is a private company and has not disclosed this information. 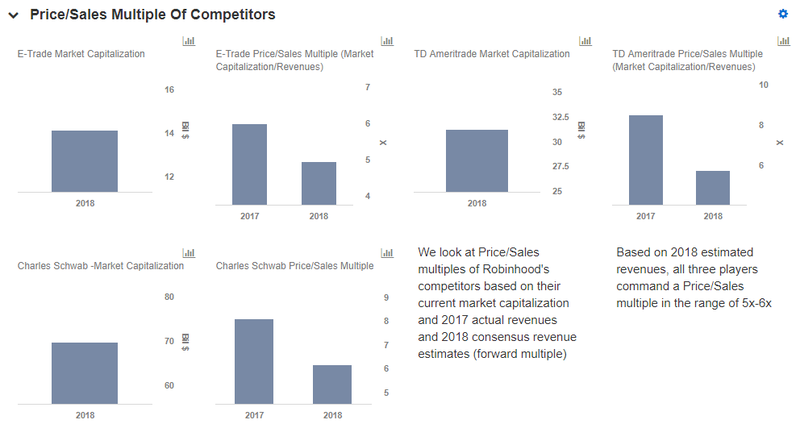 Our interactive dashboard What Should Robinhood’s Revenues Be To Justify Its $5.6 billion Valuation, looks to dissect Robinhood’s valuation and determine how much revenue the company would need to generate in the next few years in order to justify this lofty valuation, using comparable revenue multiples. While Robinhood’s incumbent competitors (E-Trade ,TD Ameritrade and Charles Schwab) have grown revenues and users steadily over the past two years, Robinhood was able to double its user base in the last 15-18 months, by targeting millennials and making cryptocurrencies available for trading on its platform. E-Trade’s growth in the number of accounts during the past 15-18 months has been significantly lower compared to Robinhood’s. 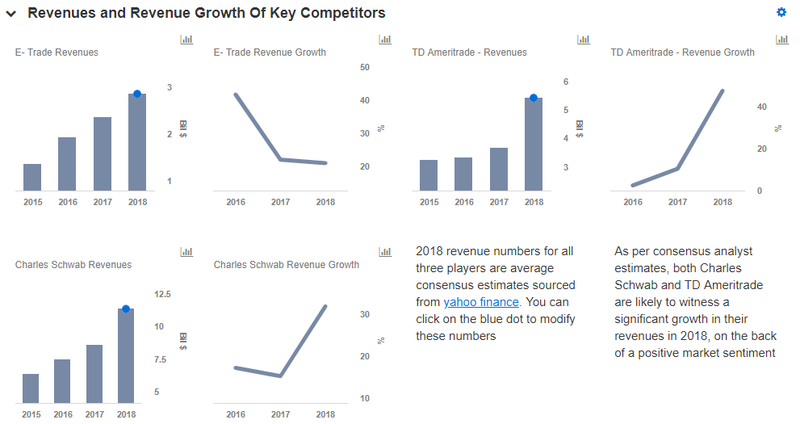 Based on their current market capitalizations and 2018 consensus revenue estimates, E-Trade, TD Ameritrade and Charles Schwab trade at revenue multiples of between 5x and 6x. Given that Robinhood is growing much faster compared to both these players, we assume that the company will trade at a substantial premium to these competitors. Based on this assumption, we apply a revenue multiple of 15x for Robinhood. If you disagree, you can modify this multiple and see its impact on the company’s revenues in our interactive dashboard here. In 2016, Robinhood introduced a subscription-based model, Robinhood Gold, for margin trading and other additional services. 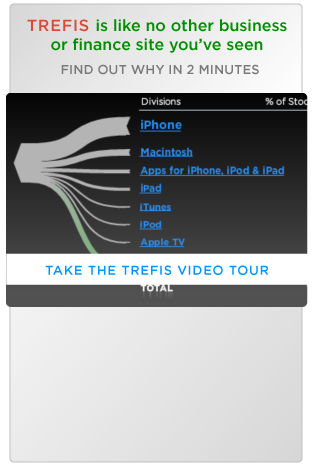 The company offers tiered subscriptions based on the amount of margin required. Subscription rates are as low as $6 per month for a margin of $2,000. Data around how many of the company’s 4 million users have a Gold subscription is not available. Robinhood also generates revenues from interest on customer deposits, though it is unclear as to how many of Robinhood’s brokerage accounts are funded and to what degree. The company also generates revenues from routing its non-directed order flow to companies such as Apex Clearing and Citadel, among others. While data around Robinhood’s revenues is not available, for the company to justify its high valuation, it needs to have a revenue base of at least $350 million and grow revenues faster than its peers to justify the high P/S multiple. With that said, competition for Robinhood is growing. In August 2018, JP Morgan announced a forthcoming trading app which offers zero-commission trading to its users. Price-based competition in this segment is likely to intensify in the future, which could make it difficult for Robinhood to live up to its current valuation.